Happy National Coffee Day – and a giveaway! Happy National Coffee Day! Yup! You heard right- we have a day dedicated to a good café’. Now the first thing I think of when I think of coffee- is creamer. I’m a big lover of coffee creamer. And my most favorite kind of coffee creamer is Coffee-mate. Vanilla Natural Bliss Coffee-mate creamer is completely synonymous with my morning coffee. I just have to have it. It always gives my morning cup ‘o joe a perfect creamy flavor that makes even Monday mornings not so bad. Now, what I didn’t know about Coffee-mate is that you can use their creamer for delicious concoctions far beyond the coffee cup. 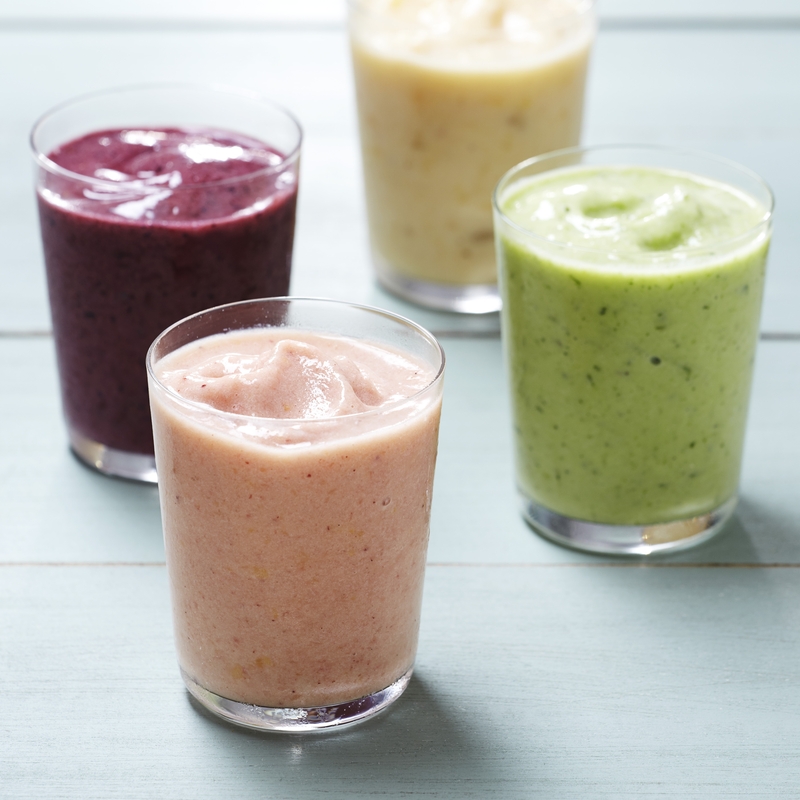 You can actually use Coffee-mate creamer to make amazing fruit smoothies! I know, I know! You can’t believe it! Well, neither did I until I had a chance to try them at BlogHer. They’re so creamy and delicious, plus they’re super-fast to throw together – I make them all the time now! – Line rimmed baking sheet with parchment paper; arrange banana in single layer on baking sheet. Freeze banana for 20 minutes or until very cold, but not completely frozen. – Place berries, banana, Natural Bliss, apple juice and lemon juice in blender; cover. Blend until smooth. Taste for sugar and lemon; if desired, add sugar or more lemon juice and blend until combined (if using fresh berries or fruit, you may need to sweeten). Serve immediately. *If using fresh berries or fruit, line rimmed baking sheet with parchment paper. Arrange berries/fruit in single layer and freeze for 20 minutes or until nearly frozen. Click here for more recipes using Coffee-mate creamer! 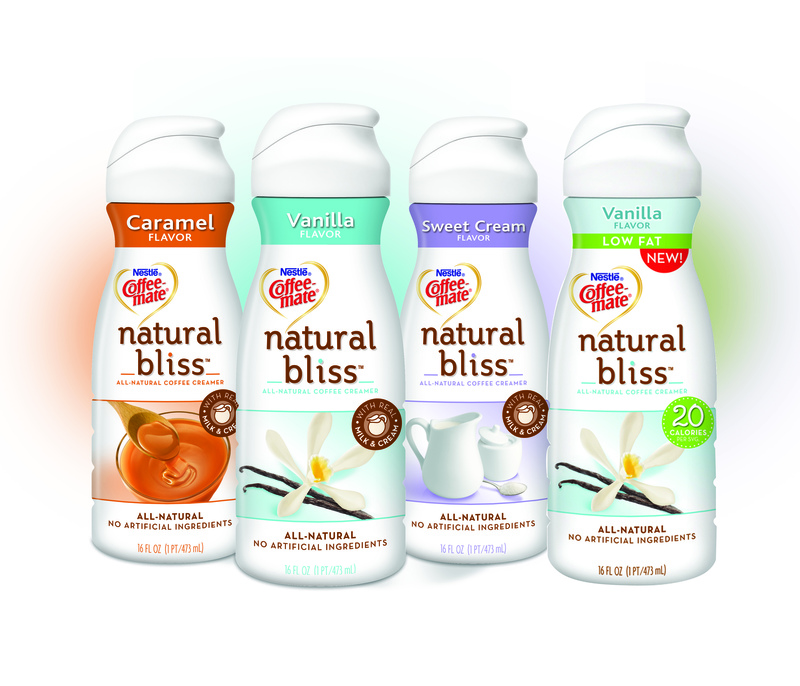 Now Coffee-mate as a brand offer over twenty different creamer flavors, with their Natural Bliss line carrying four: Caramel, Sweet Cream, Vanilla, and their new Low-fat Vanilla. I’ve tried them all- and they’re all delicious! What I really love about the Natural Bliss line (besides the flavor) is that they’re all made with only four simple ingredients – nonfat milk, heavy cream, sugar, and all-natural flavor. Natural Bliss gives you the peace of mind that comes from knowing exactly what I’m pouring into my morning cup of coffee- or my fruit smoothie! I get that creamy touch of sweetness, without any additives of preservatives, and that for me is a good quality creamer. Now, this wouldn’t be a proper celebration of National Coffee Day without a giveaway! So if you’re one of the 82% of American coffee-drinkers that add cream to their coffee, then you’ll want to stick around for this giveaway – the kind folks over at Coffee-mate want to equip two lucky NYC Talon readers with a few coupons for FREE Coffee-mate Natural Bliss creamer! So enter below, and please leave one comment per entry!!! *This giveaway runs from 9/29 to 10/07. Open to 18+, US only. All opinions represented here are my own. I was given my own coupons, in addition to the ones being given away. No other compensation was received. Winners will be selected in a random drawing. Next Post ROCKtoberfest $25 Cash Giveaway! I like NYC Talon on Facebook. I Like Coffee-mate Natural Bliss on facebook. I Follow Coffee-mate on twitter. like CNB on fb as howard wiener. like NYC Talon on twitter as gemini2346. follow you on pinterest as howard. entered rocktober fest giveaway. thx. I like coffeemate on FB. I like NYC Talon on FB. I like Coffee Mate Natural Bliss on Facebook. I like the NYC Talon on Facebook. I follow NYC Talon on twitter. I follow Coffee Mate on twitter.